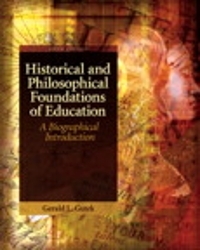 Historical and Philosophical Foundations of Education 5 Edition Structured around major movements in world history, the lives of leading educators, and the philosophies and ideologies that resulted from their ideas, Historical and Philosophical Foundations of Education: A Biographical Introduction, Fifth Edition provides a clear interdisciplinary exploration of the development of educational ideas. The author takes a global perspective on the history and philosophy of education, capturing the essence of educational evolution through the biographies of 23 theorists, philosophers, and educators. This biographical focus, combined with an introductory presentation of the inherent connections between education's major movements and its primary movers, helps students better understand the social and historical conditions that have informed today's educational arena.